How to Run Multiple WhatsApp Accounts in Single Android Phone? Do you want to run 2 or more than 2 WhatsApp accounts in your single Android smartphone? Then today I have come up with few methods to run multiple WhatsApp accounts in your device. Today I will teach you to install and run 3 more WhatsApp apps on your device along with the original one you downloaded from Google Play Store. So you can either use 2 WhatsApp accounts, 3 WhatsApp Accounts and even 4 WhatsApp Accounts. You do not need to root your device nor you have to go up with any complications to run dual or multiple WhatsApp accounts on your device. WhatsApp is one of the biggest platforms for online messaging which uses the internet data to send the messages which include text, images, videos, GIF, documents, user location, audio clips, phone contacts and voice notes to other users etc. You can even have a video chat on WhatsApp. WhatsApp Messenger is an end-to-end encrypted application for smartphones. [Danger] Do Not Use GBWhatsApp, EAWhatsApp, WhatsApp + Etc. The forked versions of WhatsApp are not safe to use even though they may promise you to provide some great features which are not available in traditional WhatsApp from the original developer. The Apps like WhatsApp Plus, GBWhatsApp, WhatsApp Prime or for any instance any other modified versions of WhatsApp may hinder your privacy as the messages are not served from the authentic servers like the one which is hosted by WhatsApp LLC. from Facebook. What are Risks of Using the Forked WhatsApp Alternatives? Risk 1. According to the online researchers at Internet Research Institute, the modified versions of WhatsApp are more prone to inject Malware and Spyware due to less secure hosted servers. They are more vulnerable to cause damage to users data. Risk 2. The mod versions of WhatsApp are not encrypted and thus whatever messages you send may be read by a 3rd person. It is very much dangerous to send any confidential info like Banking credentials, Passwords or any other personal detail may put your privacy at risk. Risk 3. Using WhatsApp Plus or GBWhatsApp is not illegal but it is against WhatsApps policies. This may trigger the company to put a permanent ban on your WhatsApp usage. Risk 4. These apps ask for permissions which are generally unnecessary for working of the app. The modded apps thus could harness users personal info which could be dangerous if your phone is used for any business purpose. The mod WhatsApps like this could be potentially dangerous to its users, thus I recommend you to do not download them even though they seem to be very much tempting. How to Safely Run Dual or Multiple WhatsApp Accounts? As you have read the risks related to GBWhatsApp, WhatsApp Plus Etc. Then today I have will tell you how to can use dual or even multiple WhatsApp accounts in your single mobile in a legal way and with complete safety. Make sure you have WhatsApp already installed on your device. Step 1. Download and install Parallel Space App on your Android device. Step 2. Open the App and look for WhatsApp. Step 4. Once the process is over, click and open the WhatsApp in Parallel space. Step 5. Now you can enter any other number of your choice on your Parallel space WhatsApp. And you can enjoy 2 WhatsApp accounts in your single phone. Step 1. Download and install Parallel Space Lite App on your Android device. Step 5. Now you can enter any other number of your choice on your Parallel space WhatsApp. And you can enjoy 3 WhatsApp accounts in your single phone. 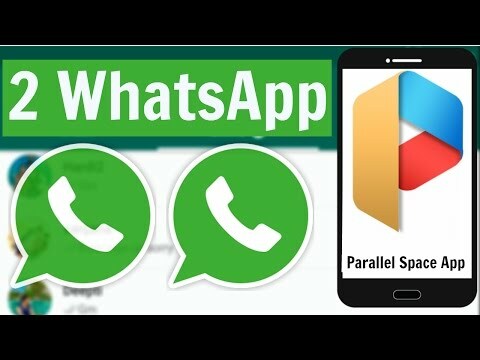 The original WhatsApp account, and two WhatsApp Accounts created by Parallel Space and Parallel Space Lite app. Similarly, you can use such multi-app creator cloning apps for the WhatsApp and run multiple accounts on your single Android mobile. To make things easier and to save the device storage space we can just use this simple trick. With this simple method, you can run 4 WhatsApp accounts by only installing 2 Clone Apps. Step 1. Download the Parallel Space App on your device. Step 3. Open the WhatsApp and enter the desired number to create the 1st WhatsApp Account. Step 4. Once done download any app listed above, for example, we say Go Multiple App from Google Play. Step 5. Open Go Multiple App, clone the WhatsApp and create a 2nd WhatsApp Account. Step 6. Now again open Parallel Space App and Clone Go Multiple App in Parallel Space App. Step 7. Now open Go Multiple App in Parallel Space App and Clone WhatsApp. Now create 3rd WhatsApp account. Step 8. Open Go Multiple App from App drawer and clone Parallel Space. Step 9. Now under Parallel Space clone WhatsApp and Create 4th WhatsApp Account. Step 9.The original WhatsApp which you downloaded from Google Store in already present in your device which makes 5th WhatsApp account. Note: You cannot clone Parallel Space Lite in Parallel Space App and Vice Versa. Consumes less space as compared to using any modded WhatsApp like GBWhatsApp. GBWhatsApp consumes approx 120 MB of space and app itself is 17-20 MB in size. On other hand, Cloning Apps are about 3-7 MB in size and consume less space while we are using WhatsApp. More secure and less vulnerable to the virus due to the cloning of apps rather than installing apps from 3rd part source. The Apps are also encrypted as its original one. You can create multiple accounts just by installing only 2 Apps as said above thus keeping storage space as opposed to installing individual Apps having a size of approx 20MB. OGWhatsApp is a trusted mod application and was the first app to meet the popular need of running two WA accounts on the same phone. The app allows you to use two different telephone numbers with WA from the same smartphone. It features a large number of themes, more limit to the number of letters in status and ability to send large sized video and audio file without worry. How to Install and Use OGWhatsApp? Take a backup of all the messages (if you wish) and then delete all of the user information for the app. Now using any File Manager, rename the /sdcard/WhatsApp directory to /sdcard/OGWhatsApp. Now verify your old number in the OG WhatsApp, and then verify your new number in the original WA. Note & Conclusion: I hope the post was very much helpful. Do comment below for any of the assistance if required. If you've any thoughts on Use 2+ WhatsApp Accounts Safely in your Single Android Smartphone, then feel free to drop in below comment box. Great Sir. Liked the post a lot. Keep it up. I have doubt. In the feature WhatsApp will be Block My 1st & 2nd Mobile Number ? Can you give me any Source ? Don’t misunderstand me. Is it Legal ? Can you give me any Source ? Don’t misunderstand me. The parallels works great, only issue is separating the contacts as both end up using the same contact list. Need one for personal and another for business. Bump, same problem here. Is there any way to choose from different gmail accounts to keep separated contacts?